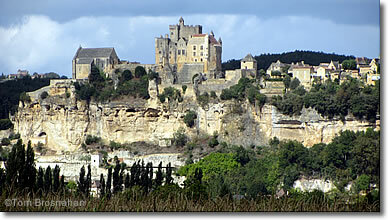 Medieval castle rising above the fertile Dordogne Valley? 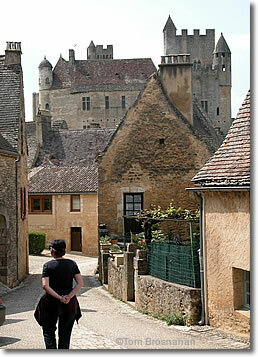 Beynac is the medieval town of your imagination. Bonus: you can canoe or cruise on the river! The castle town of Beynac-et-Cazenac, 12 km (7.5 miles, 15 minutes) southwest of Sarlat-la-Canéda (map), is just what a Dordogne castle town should be: a hill rising dramatically from the banks of the Dordogne River is crowned with a medieval château, with a jumble of picturesque stone houses and cottages descending to the riverbank at its feet. 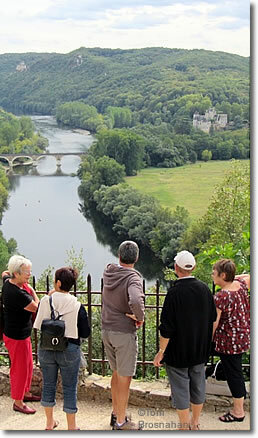 Narrow streets, no wider than walkways, ascend steeply to the castle, from which there are panoramic views of the river, the fertile countryside, and of neighboring châteaux. It can take between 15 and 25 minutes to walk from the riverside car parking lot to the portal of the château crowning the town. Other parking lots are situated farther up the hill, but all will be busy—and perhaps full—in the warm months, so driving up into the town is not recommended unless someone in your party has mobility challenges. Canoes are available for rent on the riverbank, and 45-minute river cruises in traditional gabarre riverboats are offered when demand warrants. The Office du Tourisme is right at the junction of the shore highway and the road leading up to the castle. Several restaurants and café-bars are prominent nearby, overlooking the river, and another is just opposite the castle entrance high on the hill. from near the château in Beynac. Le Château de Beynac, France.